This defrosting tray means no microwaves and no hot water are needed to thaw meat. The sleek design is made with conductive aluminum and a biosafe thermal liquid. Place unwrapped, frozen meat, chicken, or fish on the tray’s surface and the tray gets to work promoting rapid heat exchange. This thaws proteins quickly and evenly and gets you to the dinner table faster. Dimensions: 13" x 8" x 0.75"
A slight tilt into a drip tray catches run-off and silicone strips give the tray extra grip. Now there’s no need to use the microwave or rely on drippy baggies in bowls of water. And the thawing tray does the job in less time, too. 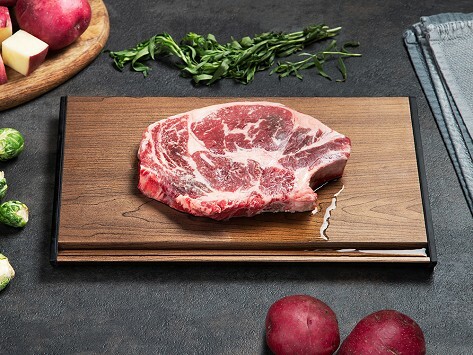 Its sleek-looking wood grain finish looks great out on the counter and it is a major time saver when you’re trying to pull a meal together.